A £2m state-of-the-art walk-in centre for emergency health care in Kent is holding its official opening. Maidstone Hospital is among the first in the UK to have a nurse-led minor injuries unit, traditional A&E and GP out-of-hours services under one roof. "This is certainly the way forward," said centre manager Mark Atkinson. The unit, along with the hospital's refurbished physiotherapy gym, is being opened on Wednesday by Mayor of Maidstone, Cllr John Horne. 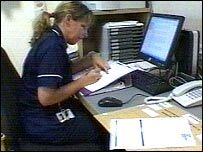 The transformation of the original A&E Department at the Hermitage Lane hospital began in May 2004 and was carried out in phases. The Emergency Care Centre now includes a resuscitation area, nine consulting rooms, children's play area, new waiting and reception area and a five-bed ward. It also has a nurse practitioner service for minor injuries and illnesses, such as stomach upsets and ear infections. "You can now be seen by an emergency nurse practitioner, possibly a physiotherapist, or a paramedic who has expanded skills," said Mr Atkinson. Patient Andrew Thompson, who stood on a poisonous weaver fish while in France has visited the centre more than once. "They put me on a course of antibiotics first of all and now they have just lanced the wound and I'm just going up to the ward," he said. The out-of-hours GP service provides telephone advice and urgent appointments for patients needing to see a doctor when their own surgery is closed. The physiotherapy gym has been redecorated with an "outdoor" theme in its £150,000 refurbishment.